Add the wrong toppings to a salad and you can double or even triple the calorie count! 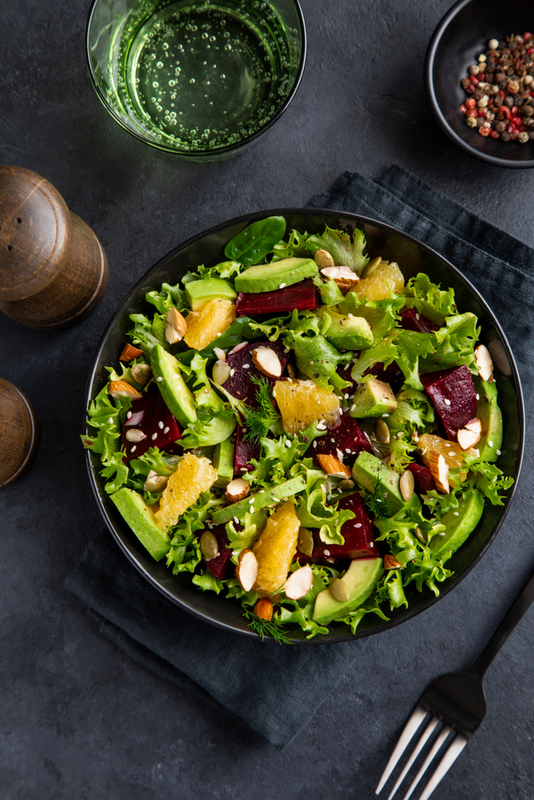 The salad bar can be a tough thing to navigate — use these tips for what to avoid on your next lunch break for a healthy, low-calorie meal. These are probably the worst dressings you can choose. Take ranch dressing, for example, one serving of two tablespoons has 140 calories — and 130 of those calories are coming from FAT. Other dressings like blue cheese, Caesar, parmesan, or chipotle all fall under this category of dressings to avoid. Not only are they loaded with fat, but they also have high levels of sodium and very little nutritional value. Healthy Alternative: Stick to vinaigrettes — though even some of these can be high in sodium levels, too. I prefer to use just a small amount of extra-virgin olive oil with balsamic vinaigrette. If you don't want to give up your beloved ranch dressing, just drizzle a small amount over your salad or have a taste of it to suppress your craving. You could also use this old dieting trick: Dip the tip of your fork into the dressing before you put it in the salad to get just enough taste with each bite without drowning it in dressing. Nuts are healthy fats and a great addition to any salad — that is, until they're kettle-cooked and glazed with sugar. A lot of companies sell glazed walnuts and pecans, and you can find them sprinkled on an array of salads at restaurants across the country. Are they the worst topping on this list? No, but they're not that great for you either. Healthy Alternative: Stick to dry-roasted nuts to save on calories. I like to add sliced organic almonds to my salads, but chopped organic pistachios, pecans, and walnuts are a good addition too. Remember: Add nuts as a light topping — don't overdo it. An ounce or two can pack in a lot of fat depending on the nut you choose. Wherever Mexican food is sold, people always order something like a "Southwestern Salad" thinking that they're making the healthier choice by not ordering tacos or other Mexican dishes. They couldn't be more wrong! These salads are loaded with cheese, creamy dressings, and high-calorie tortilla chips — or worse — served in a tortilla bowl! The Quesadilla Explosion Salad at Chili's (which already sounds like a diet buster!) contains tortilla chips and clocks in at 1,400 calories with 93 grams of fat. Whoa! I want you to stay far away from these kinds of salads, and especially tortilla chips or shells, from now on. Healthy Alternative: You can still order a Mexican-inspired salad, just make some modifications. Request balsamic dressing on the side instead of ranch and hold the tortilla chips and cheese, but keep the rest of the healthy goodies like black beans, corn, and tomatoes. I encourage you to always add some sort of protein item to your salad, but steer clear of anything fried. These additions are packed with unnecessary calories and loads of sodium. It's not just fried chicken I'm referring to here — this covers fried onions, fried falafel balls, fried seafood, and anything else fried. They will turn your healthy salad into a total caloric splurge. Wouldn't you rather save your calories for dessert? Healthy Alternative: If you're going to add some protein to your salad, choose grilled items only. Consider healthier protein options like shrimp, tuna, egg whites, or a veggie burger. First let me clarify, cheese isn't ALL bad. Three or four daily servings of low-fat dairy products can boost your body's fat-burning potential. Studies have shown that organic dairy-rich diets may help weight loss and the body's ability to burn fat. Yet when some people add cheese to a salad, they really pile it on — and that's why it's on this list. But some cheeses are more nutritional than others, and there are HEALTHY ways to add them to your salad. Healthy Alternative: Feta is a great choice for salads because it is lower in fat and calories than most cheeses. Another idea is to buy string cheese (part-skim mozzarella) sticks and add one to your salad by cutting it up into pieces, which will also help you practice portion control. Craisins, or dried cranberries, are a fruit, so that means they're good for you, right? Well, not exactly. I know these are everyone's favorite sweet treat to add to any salad — but they have more sugar than you'd think! Craisins and their cousin, raisins, are called "nature's candy" for a reason! Though they are fat-free and relatively low calorie at 130 for a ¼ cup — they're full of sugar — 29 grams to be exact. Healthy Alternative: If you can't give 'em up, I suggest counting them out and only adding 10 or so to your salad. Otherwise, why not add other seasonal fruits to sweeten up your salads? I love adding organic strawberries or blueberries to mine! Croutons are an easy way to ruin your salad by adding refined carbohydrates. Croutons from a popular brand are about 30 calories for just six pieces. Do most people put only six croutons on their salad? Not likely. These toppings can also have high sodium levels depending on how they're prepared. Healthy Alternative: Bread isn't bad if you're eating 100 percent whole wheat! You can definitely get a bread roll to accompany your salad, but keep it healthy and put it down when you're full.